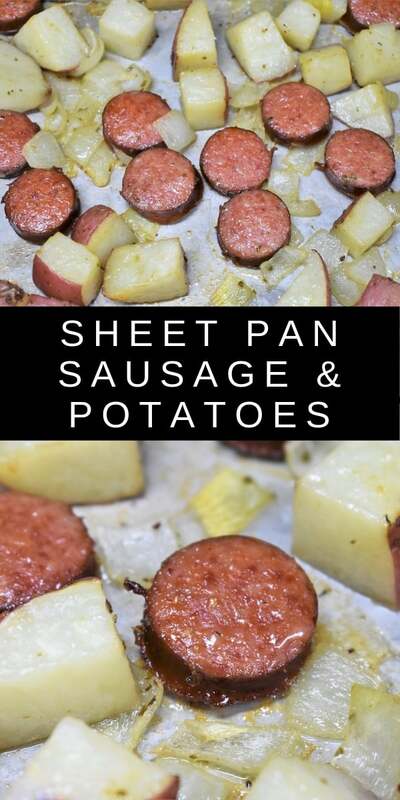 This sheet pan sausage and potatoes is the dinner to make when you’re short on time, money and energy. 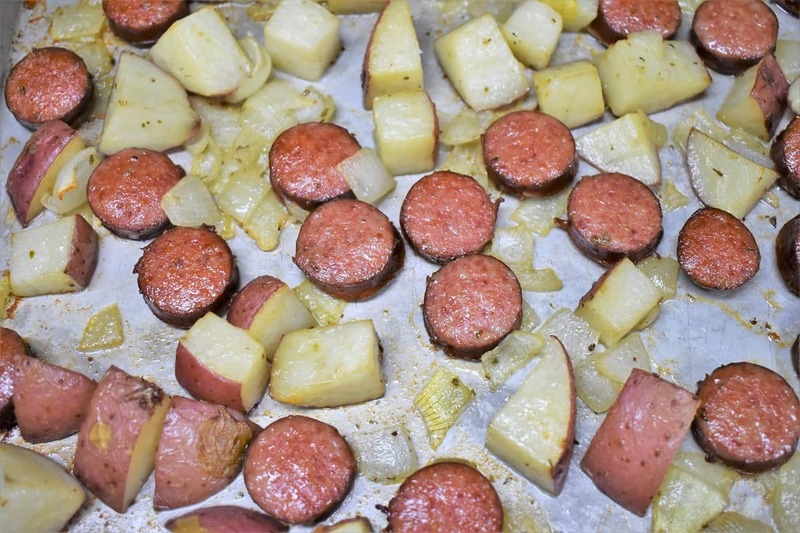 In this recipe we use a fully cooked polka kielbasa sausage, red potatoes and onions. Then everything is seasoned and baked until the sausage is golden and the potatoes are tender. 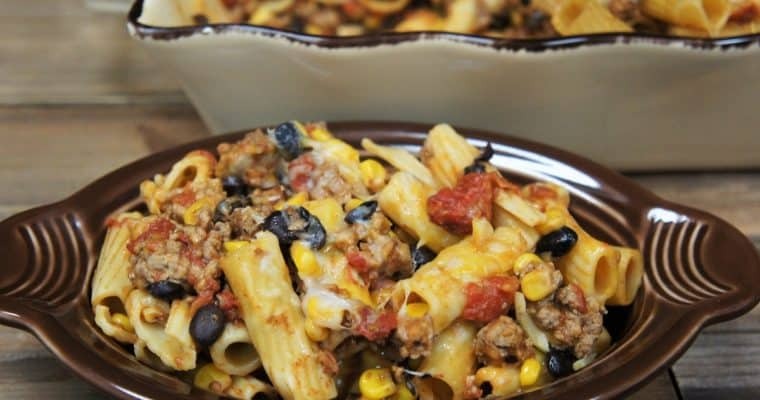 This is a delicious and easy dinner that only requires a handful of affordable ingredients and very little effort. Don’t let the long cooking time put you off. It’s mostly hands off, so you’re free to go about the other 100 things you have to do that evening. Prep work is a snap in this sheet pan dinner. 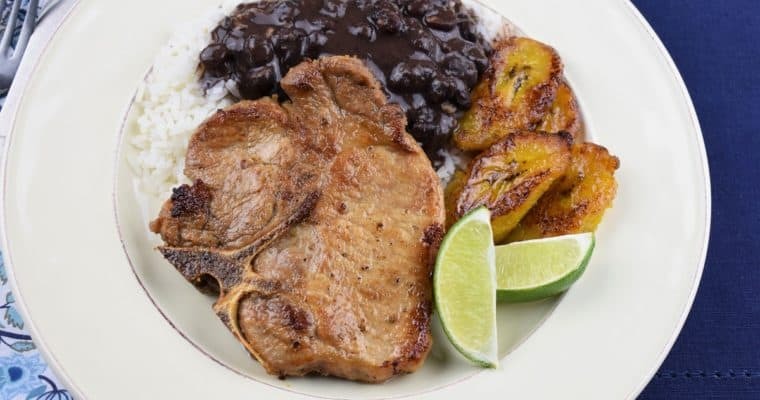 There are only three ingredients to prepare and they will all go into the same bowl. Let’s start with preheating the oven to 350°F. 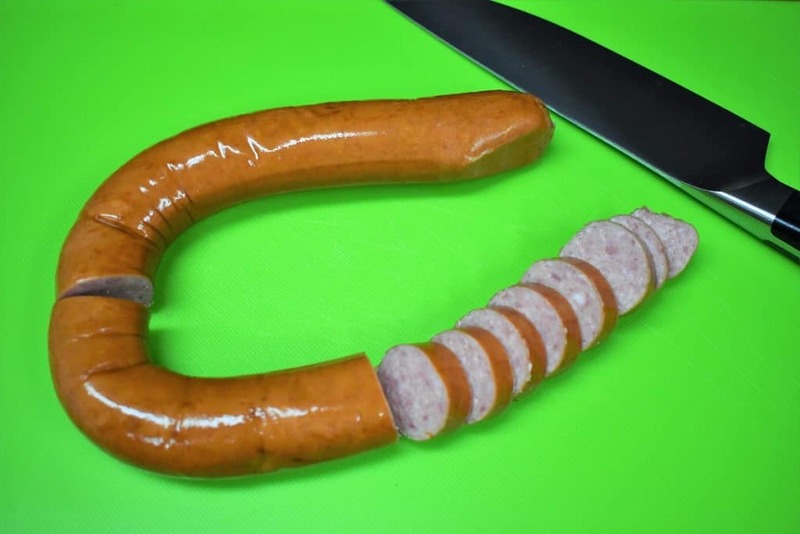 Cut the sausage into roughly ¼ – ½ inch rounds. Keep them bite sized. Next, cut the potato into 1 inch pieces, again keep them bite sized. Don’t peel the potato, the red color looks beautiful. 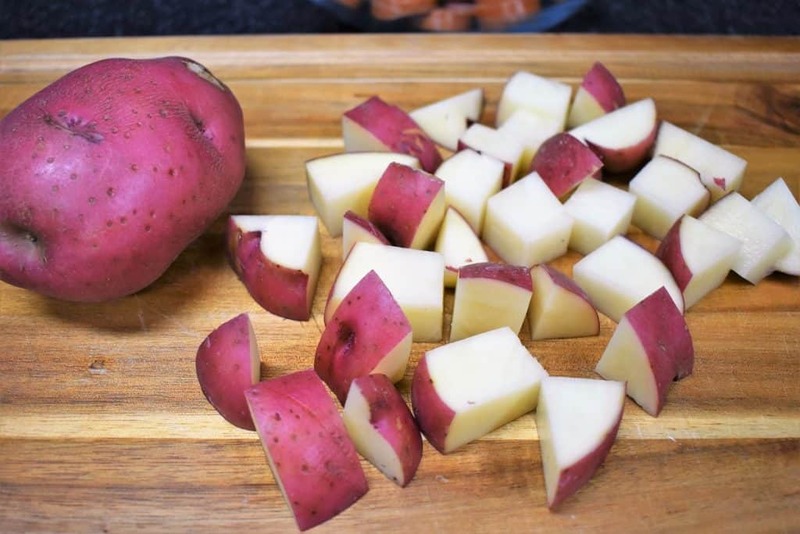 Plus, the skin is so thin on red potatoes that it really doesn’t make a big difference texturally. Don’t cut the potatoes too small so they hold up to the baking time and the stirring. Finally, cut the onions into roughly ¼ – ½ inch pieces. Don’t dice them too small or they’ll just about disappear with the baking time. Now, add the sausage, potatoes, onions and canola oil to a large bowl. 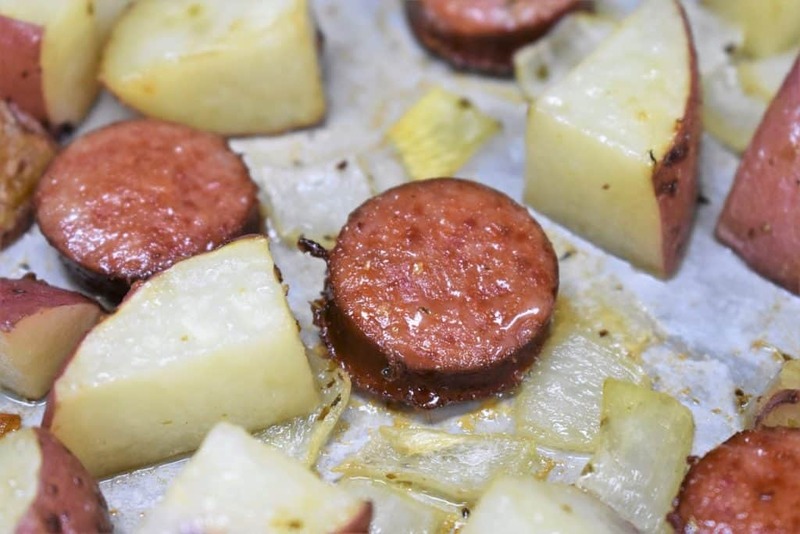 Use a rubber spatula to stir and toss the sausage and potatoes and coat them with the oil. Add the kosher salt, garlic powder and oregano to the bowl and stir and toss again until everything is coated with the seasoning. Spray the sheet pan lightly with the cooking spray. 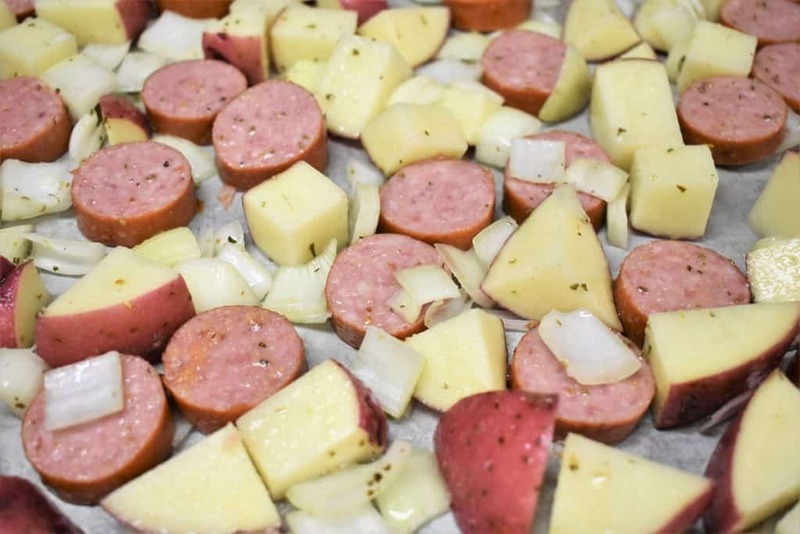 Add the sausage and potatoes and arrange them so that they are in a single layer and not mounded. 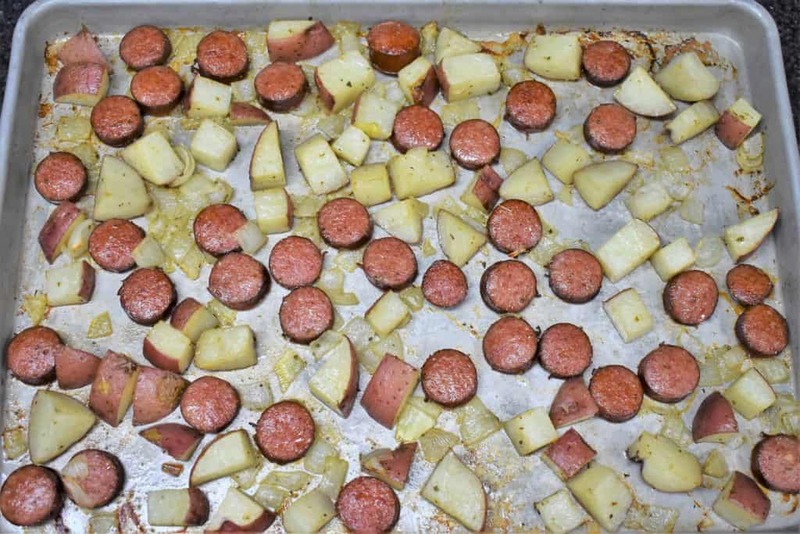 Bake the sausage and potatoes for 15 minutes. Remove the baking sheet from the oven and give everything a good stir, while turning the pieces. Arrange the sausage and potatoes again so that they are in a single layer. Remove the baking sheet from the oven and stir one last time. Again, turning the pieces and arranging everything in one layer. Bake for 15 more minutes, or until the potatoes are tender and we’re done! Serve the sausage and potatoes with toasted bread or crackers and hot sauce, if desired. 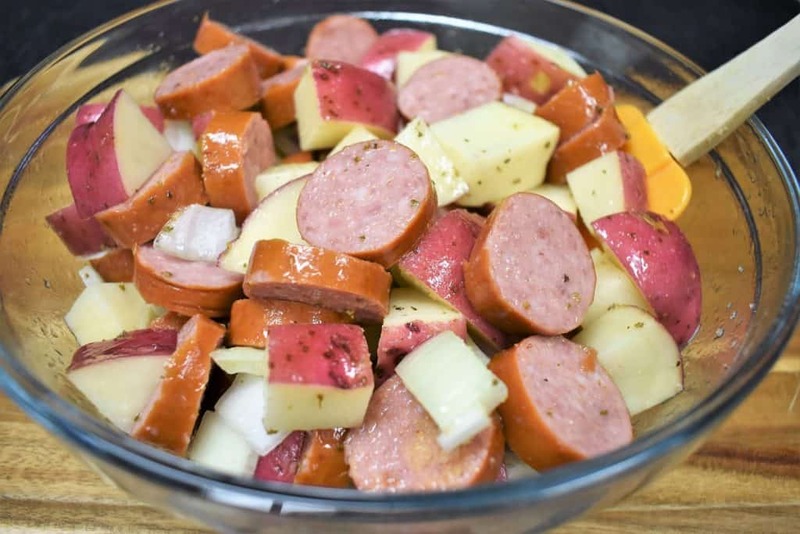 Add the sausage, potatoes, onions and canola oil to a large bowl. 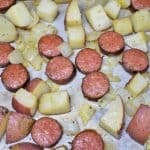 Use a rubber spatula to stir and toss the sausage and potatoes and coat them with the oil. Remove the baking sheet from the oven and give everything a good stir, while turning the pieces. Arrange the sausage and potatoes again so that they are in a single layer. Bake for 15 more minutes, or until the potatoes are tender, and we’re done!